What does ‘The Soul Man’ do on Sunday? He worships God, and on July 15, that’s just where he was – praising the Lord at three Los Angeles area churches. Cedric The Entertainer, who portrays the Rev. Boyce ‘The Voice’ Ballentine on TV Land’s ‘The Soul Man’ sitcom, joined his family and cast members at First A.M.E. Church, West Angeles Church of God in Christ, and The City of Refuge. “It’s a blessing to be here and have an opportunity to talk about my show. You could see I was about to go to the big ‘desk’ before Pastor John (Hunter) pulled me back,” he jokingly told FAME’s 1,000+ members at the 10 a.m. service. “We’ve had great shows in the past like ‘Amen,’ but I had the vision for this show, where we could talk in our community about some of the issues that are going on, show a family that’s loving, growing, learning, and we do it with each other. “We hear talk about African Americans not having any presence on television and film, but when we have them, we must support these shows,” said Cedric. 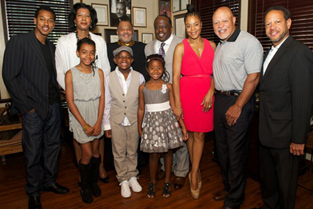 The series, created by Cedric and Suzanne Martin, revolves around the Rev. Ballentine, an R&B superstar-turned-minister. Upon hearing the call to ministry, he leaves his career and high life in Las Vegas to serve in his father’s church in St. Louis. Reluctantly joining him are his wife, Lolli (played by Niecy Nash) and daughter, Lyric (played by Jazz Raycole). Rounding out the cast are Barton, Boyce’s cantankerous father (played by John Beaslely) and Stamps, Boyce’s crafty brother (played by Wesley Jonathan). Reviewers agree that the show provides comedic, yet realistic, insights into the faith-based African American community. A Sunday in the life of The Soul Man continued at The City of Refuge led by Bishop Noel Jones. Nearly 2,000 parishioners viewed a special videotaped message from Cedric before hearing from ‘The Soul Man’ himself. “It’s great that Bishop Jones allowed me to come in. I have known him for a long time. He married me and my wife 13 years ago,” said Cedric. Bishop Jones revealed, “The reason I allowed Cedric to speak is that I know it’s going to be tasty, it’s going to be tasteful and the show is going to impact many people. I think that’s a good thing. Entertainment is a good way to transfer a great many values. Uplifting people is a quality instilled in Cedric at a young age according to Eric Rhone, executive producer of ‘The Soul Man’ and his business partner since 1983. “Cedric has a very strong family and upbringing back in Missouri, so those core values of respect and family have always been there for him. We want to put out positive images and messages that we can all be proud of, particularly young people who come into this business after us,” said Rhone. Cedric shared similar intents as he explained how the church became the setting for the show. “I started looking at demographics, niche markets. For us, I knew that black people are so spread out economically, but one place we come together is in the church environment. From hoodlums to educators, all of them are trying to be saved,” he said. Another strength of ‘The Soul Man” is its ability to portray a variety of challenges encountered by both pastors and parishioners. ‘The Soul Man’ airs on Wednesdays at 10 p.m. on the TV Land network. Check cable or local listings for the channel.